Summarize the multi-step processes of manufacturing glass-fused-to-steel (porcelain enameled) tank panels. Discuss the health and safety advantages of using glass-fused-to-steel tanks for the storage of potable water, corrosive and other liquid applications. Identify the components used in glass-fused-to-steel technology and the tests used to ensure quality control. Evaluate the comparative lifetime values of glass-fused-to-steel and other types of storage tanks. There are multiple advantages in using glass-fused-to-steel tanks for the storage of potable water, corrosive and other liquid applications. In addition to ease of assembly, they have greater lifetime value, far lower maintenance costs and little environmental impact compared with other liquid storage structures. With tens of thousands installed worldwide over the past 65-plus years for municipal and industrial applications—they also have an extensive proven performance record. This course describes glass-fused-to-steel technology—also known as the process of porcelain enameling, its benefits, applications and compliance with testing standards. Case studies of porcelain enameled tanks that have been in continuous use for decades are also examined. Initially developed as a proprietary process for fusing glass to steel for the manufacture of large, single-piece, glass-lined brewery tanks and later glass-lined hot water heaters, the first glass-fused-to-steel tank went into service in the 1940s as feed storage silos. While many are still used for agricultural purposes, since the 1970s, these tanks are predominately used for water, wastewater and other liquid storage uses. The physical properties of glass coating are especially suited to municipal and industrial storage applications since they form a hard, inert, inorganic barrier for both the interior and exterior tank surfaces and guard against weather and corrosion. As a direct result of fusing glass to steel, the glass coating is impermeable to liquids and vapors, controls undercutting caused by corrosion and offers substantial impact and abrasion resistance. 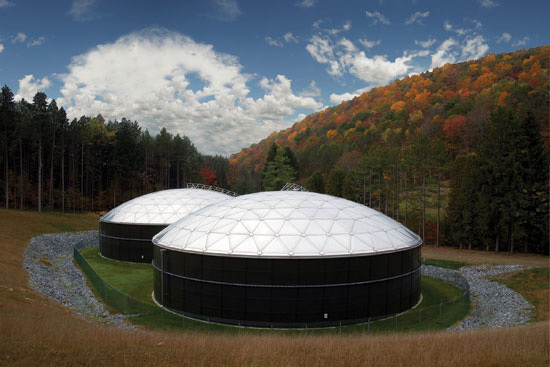 Glass fused to steel tanks require the lowest maintenance over the life of the tank compared to other storage structures, and have an allowable service range of 140°F at 3-11 pH. The physical properties of porcelain enameled tanks are specifically suited for municipal and industrial liquid storage.